I wasn’t really sold on Mazinkaiser SKL until the titular mech received a gouged eye from a beating. 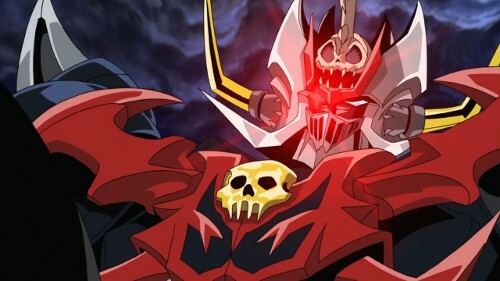 I always found the original Mazinkaiser to be boring, because it was too invincible for its own good–in fact, the Mazinkaiser movie was centered on keeping Kouji away from Mazinkaiser as much as possible, and the final battle itself was rather anticlimactic. The eye scar was, to my memory, first done in Super Robot Wars Alpha 3, in Touma Kanou‘s path. When Touma receives his new mech, the DaiRaiOh, he gets a rematch with his longtime rival, Baran Doban. This scuffle leaves the DaiRaiOh’s right eye damaged. Interestingly enough, Touma refuses to allow the damage to be repaired after the battle, claiming it as a mark of his rivalry. Instead, an eyepatch is installed, which is reflected in the animation for his mech’s final attack–eye scar closeup and all–when it is unveiled against a Balmarian general. I wouldn’t know if the show’s staff thought of DaiRaiOh when they gave Mazinkaiser SKL an eye scar, but that simple touch made the mech–and the anime itself–a lot more enjoyable for me. This entry was posted in Anime, Games, Mecha, SRW and tagged dairaioh, mazinkaiser skl, srw, super robot wars. Bookmark the permalink. Also, you’re forgetting Dix-Neuf, which also had an eyepatch (yeah, actually a horn trough the head, but it looks the same) that was removed during a powerup. Good catch, though did they ever explain why it was there? I forget my Diebuster. It was apparently some space monster’s horn that was lodged in there during some battle. I guess it was just left in there because it didn’t affect performance or something. I think it was explained that they left it there because removing it could possibly fatally harm D-N’s neural circuits, causing him to lose his memories or something like that. Wasn’t sold? It’s the best in super robot action from the get-go. I’m not fond of Mazinkaiser, and SKL wasn’t that different for me, until episode 3. I think it’s all better now! It sounds like I didn’t appreciate the show that much, but I really did.